We are a micro business – a small software development company based in Billingham, which is just over the other side of the Tees from Middlesbrough. After I set this up I spent several years working as a one-man-band. But because of a big project I decided I needed to move into an office and hire a graduate programmer who could take over the technical work to allow me to concentrate on the management. 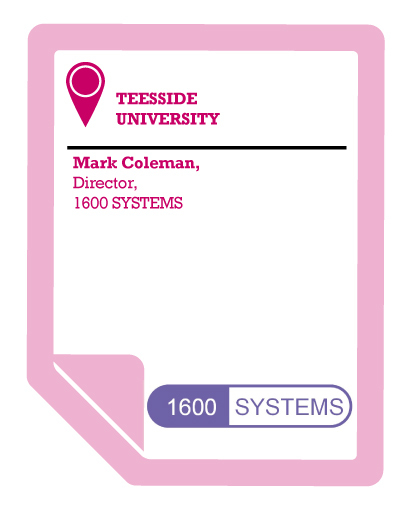 So last year I put an advert on the Teesside University website. One of the applicants we got proved very promising and so he started at the beginning of September. I’ve been hugely pleased with the contribution he’s making and I’m probably going to be looking for a second person in March or April. Teesside University has a motivation to help local businesses. For example they offer the opportunity to provide a particular programming task to students as a year-long project. They identify a student who is appropriate for that project and guarantee to provide them with academic support for the duration so you have very good access into the lecturing staff at the University. They also hosts local events which are really helpful for my business. For example, they hosted a ‘meet the buyers’ event which introduced me to potential new clients– police forces, councils, fire brigades, a good cross section of companies. I think one of the things that appealed and will appeal to a lot of micro and SME businesses is that there was a certain amount of financial support to help take a graduate on. If that hadn’t have been there I would still have done it but it was just a bonus. Teesside University has been very positive in advising me. I’ve been working on a major project which is just about to go on sale internationally – a piece of software to be built online. It’s radically different to anything I’ve done before and certain aspects of security, preventing illegal copy etc., are very much outside of my experience. I approached the University and said I had this problem and they identified a particular member of staff who was an expert in that field and gave me a lot of advice. A very valuable resource to be able to access. One of the things I was very pleased about is something that happened just a couple of weeks ago. There’s a particular project that the graduate is working on at the moment now that we’ve set the design parameters he’s working autonomously on it. Since that project started we went out to see the client two weeks ago and do a demonstration of what had been completed so far and the client was very pleased with the progress. Very satisfying. It confirmed to me that this graduate knows what he’s doing, he’s done a good job and also confirms that he and I are on the same wavelength. In a micro business that’s an important factor. When you’re in a small business you need that confidence that somebody who is working for you can be trusted to make the progress in what they’re dealing with at the time. What we’ve done is to significantly enhance things from a technical point of view in a number of areas of this project and so the product has been improved because of the graduate and the advice of the University. As a result, I believe it will be more positively received by customers and will provide for greater sales. That, in turn, will give me the chance to look at expanding the company in other ways, raising our profile with a number of different networking organisations across the North East. It will therefore be a circular thing, more of a chance that we might even next year be able to take on another graduate. I think Teesside University has made the process really easy in terms of recruitment and administration. I’m highly impressed with what they’ve done.